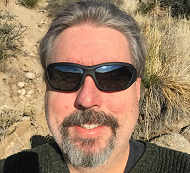 Hello, I'm currently (since Aug. 2015) a senior member of the technical staff at Sandia National Labs with a position designation of R&D S&E (Research & Development / Science & Engineering), Computer Science, with a primary appointment in the Cognitive & Emerging Computing department (1421) within the Extreme-Scale Computing Group (1420) at the Center for Computing Research (1400) in the Science & Technology division (1000). (My business card lists my title as "Senior Engineering Scientist," which seems suitably ambiguous.) My office is in the Computer Science Research Institute (CSRI) building. My previous position spanning most years in the period 2004-2015, was as a faculty member in the ECE Department at the FAMU-FSU College of Engineering. This overlapped with a research associate position in the FAMU Physics Department from 2009-2012. Before that, in 1999-2004, I was an assistant professor in the CISE Department at the University of Florida. Some of my old research webpages are still available (e.g., a page at FSU, a rehosted page from UF). I did my graduate work in the MIT EECS program in the 1990s, and my undergrad in the Symbolic Systems program at Stanford. Most of my research relates to reversible computing, and in Sep. 2017, a general article that I produced on the subject was published in IEEE Spectrum (based on a longer manuscript). Also, in Oct. 2017, I delivered a publicly-available lecture on the subject at the Stanford EE department's Computer Systems Colloquium. I also authored the material discussing reversible computing (and co-edited the material on other emerging computing paradigms) that appeared in the Beyond CMOS chapter of the 2017 International Roadmap for Devices and Systems (successor to the long-running International Technology Roadmap for Semiconductors). Most recently, I delivered invited talks on reversible computing at the 3rd IEEE International Conference on Rebooting Computing (video, slides) in Nov. 2018, and the IEEE International Nanodevices & Computing Conference (slides) in Apr. 2019. I've been working lately to clarify the theoretical foundations of reversible computing, and to generalize the concept of reversible computing in useful ways. For example, I recently presented a paper titled "Physical Foundations of Landauer's Principle" (for which slides and an extended postprint are publicly available) at the 2018 Reversible Computation conference. This paper shows how Landauer's Principle (relating information loss from a computation to entropy increase) can be rigorously inferred from fundamental principles of statistical physics that have been known for over a century, and emphasizes the essential role that correlations (in the sense of mutual information) play in its derivation. It also discusses how to appropriately generalize Landauer's principle and reversible computing to account for the thermodynamic implications of performing stochastic (randomizing) computational operations. In 2017, I presented a paper on what I call Generalized Reversible Computing (GRC) (a preprint and slides and a longer manuscript are available) at the Reversible Computation conference. This paper calls attention to the fact that the traditional definition of logical reversibility is insufficiently general, because it ignores the reversibility of operations that are only conditionally reversible, but whose preconditions for reversibility are satisfied. Compared with the traditional theory of unconditionally reversible computing, GRC is more well-suited to use as the basis for adiabatic circuit design, and in general facilitates simplified designs for reversible hardware that can't be properly modeled within traditional reversible computing theory. Since late 2016, I've also been developing a new concept of Asynchronous (Ballistic) Reversible Computing (ARC or ABRC)--which I formally presented (preprint, slides, video) at the 2017 Rebooting Computing conference--which potentially could eliminate a lot of the clocking-related overheads that are associated with traditional adiabatic models of reversible computing, while also potentially operating at higher speeds, and avoiding the chaotic instabilities that are often associated with synchronous ballistic models of reversible computing, such as the classic Fredkin/Toffoli Billiard Ball Model. An effort to implement the ABRC model using single flux quanta (SFQ) in Josephson-junction based superconducting circuits is currently starting up at Sandia. A preliminary report (poster, preprint) on my work-in-progress on this project has been published. Earlier in 2016, I explored another concept for clockless reversible computing called Chaotic Logic (CL) (paper, talk, simulator), in which we tailor the nonlinear interactions between individual degrees of freedom in a conservative dynamical system in such a way that the natural chaotic dynamics of the system encodes a desired computation in its long-term average behavior. Our preliminary simulation results appear to confirm our prediction that, using Chaotic Logic, reliable computation can still be carried out even using very tiny logic signal energies (at and even below the thermal noise floor). Prior to all this, in Fall of 2015, I participated in inter-institutional discussions which led up to the White House's announcement of a new Grand Challenge for future computing. I provided input to the process of drafting the IEEE White Paper which supported (and helped inspire) this announcement. An accompanying poster was also presented at the 4th IEEE Rebooting Computing Summit (in Dec. 2015) and some related papers were presented at the IEEE International Conference on Rebooting Computing (ICRC 2016) (in Oct. 2016). The general vision there was for a new type of future computer which harnesses nonlinear dynamical behavior of nanodevices operating "at the edge of chaos" to perform brain-inspired functions (such as Deep Learning) in a more energy-efficient way, by stepping outside the traditional paradigm of (irreversible) Boolean logic. This broad vision subsumes reversible logic, neural-inspired computing, analog circuits and other computing approaches that have yet to be defined. Following are some publications, manuscripts and presentations from my pre-Sandia years (therefore no SAND numbers), listed most recent first. My more recent publications, through Sandia, are shown under "Selected Publications and Presentations" at the bottom of this page. Michael P. Frank, "The Path to Discovering the Next Great Device Technology," job talk presented at Sandia National Labs, Albuquerque, NM, May 20, 2015. Michael P. Frank, “NDCoin: A Cryptocurrency-Based Distributed Computing Market,” ECE Graduate Seminar, presented Sep. 9th, 2014, in the Dept. of Electrical and Computer Engineering, FAMU-FSU College of Engineering, Tallahassee, FL. PDF of talk slides. Michael P. Frank, “Decentralized Virtual Currencies: A Very Far-Reaching Innovation (The Case for Regulatory Permissiveness),” invited talk at the Florida Office of Financial Regulation, Tallahassee, FL, July 30, 2014. Handout of talk slides (2/page) in PDF. Michael P. Frank, Kamal E. Amin, Okenwa I. Okoli, Sungmoon Jung, Robert A. Van Engelen, and Chiang Shih, “Expanding and Improving the Integration of Multidisciplinary Projects in a Capstone Senior Design Course: Experience Gained and Future Plans,” paper ID #9523 in the Proceedings of the 121st ASEE Annual Conference & Exposition, Indianapolis, IN, June 15-18, 2014. Michael P. Frank, “Reversible Computing: A Cross-Disciplinary Introduction,” invited talk presented remotely to the Beyond Moore Research Challenge meeting, Sandia National Laboratories, Albuquerque, NM, March 10th, 2014. Slides in PowerPoint, PDF. Michael P. Frank and David Mondrus, “Introducing NDcoin: A Cryptocoin-Based Concept for Incentivized, Distributed Nondeterministic Computation,” draft whitepaper, Feb. 1st, 2014. PDF at http://ta.gd/NDcoin. Michael P. Frank, “Digital Cash, Bitcoin, and the Distributed Consensus Revolution,” ECE Graduate Seminar, presented Jan. 14, 2014, in the Department of Electrical and Computer Engineering, FAMU-FSU College of Engineering, Tallahassee, FL. PDF of talk slides. Michael P. Frank, “Why Portfolio Rebalancing Works: An Analytical Demonstration,” research memo, Dec. 21, 2013. https://dl.dropboxusercontent.com/u/3133557/Bitcoin/rebalancing.pdf. Darryl W. McGowan, Jr., David R. Grosby, Michael P. Frank, Sachin Junnarkar, and Ray H. O'Neal, Jr., “Field Programmable Gate Array based Front-End Data Acquisition Module for the COSMICi Astroparticle Telescope Sytem,” poster presented at Centenary Symposium 2012: Discovery of Cosmic Rays, Denver, CO, June 26-28, 2012. Abstracts at: https://portfolio.du.edu/portfolio/getportfoliofile?uid=214129. Darryl W. McGowan Jr., David R. Grosby, Michael P. Frank, Sachin Junnarkar, Ray H. O'Neal Jr., "Field Programmable Gate Array based Front-End Data Acquisition Module for the COSMICi Astroparticle Telescope System," preprint for journal publication, Apr. 2012, arXiv:1204.5104 (PDF available). Michael P. Frank, “Towards a More General Model of Reversible Logic Hardware,” invited talk presented at the Superconducting Electronics Approaching the Landauer Limit and Reversibility (SEALeR) workshop, sponsored by NSA/ARO, Annapolis, MD, Mar. 15-16, 2012. PDF of talk slides. Michael P. Frank, “Space-Efficient Quantum Computer Simulators,” invited talk presented at the Laboratory for Physical Sciences at College Park, MD (revised version of SPIE 2009 talk), Mar. 14, 2012. PDF of talk slides. Michael P. Frank, "Controlling application-specific hardware in C on Altera FPGAs: a case study in embedded systems development," presented at the ECE Graduate Seminar, FAMU-FSU College of Engineering, Oct. 4th, 2011. Presentation PDF (2 MB). Michael P. Frank, Sachin S. Junnarkar, Triesha Fagan, Ray H. O'Neal, Jr., and Helio Takai, "Design of a Wireless Sensor Network with Nanosecond Time Resolution for Mapping of High-Energy Cosmic Ray Shower Events," presented in Session 1: Sensor Networks I of Conference 7706: Wireless Sensing, Localization, and Processing V, in the Information Systems and Networks: Processing, Fusion, and Knowledge Generation program track at the SPIE Defense, Security and Sensing Symposium, Orlando, FL, April 5-9, 2010, and to be published in the Proceedings of SPIE, vol. 7706, paper 7706-2 (2010). Preprint PDF (597 KB). Presentation PDF (6.4 MB). Frank, M.P. and O'Neal, R.H., "The COSMICi Project: Wireless sensor networks for measuring direction of high-energy cosmic-ray showers," presented at the 2009 MARIACHI workshop, Jul. 6-10, SUNY Stony Brook, NY. Presentation PDF (745 KB). Michael P. Frank, Liviu Oniciuc, Uwe H. Meyer-Baese, and Irinel Chiorescu, “A space-efficient quantum computer simulator suitable for high-speed FPGA implementation,” Proceedings of SPIE, vol. 7342, Quantum Information and Computation VII, E. J. Donkor, A. R. Pirich, and H. E. Brandt, eds., 734203, 2009. Manuscript as sumitted. Michael P. Frank, Uwe H. Meyer-Baese, Irinel Chiorescu, Liviu Oniciuc, and Robert A. van Engelen, "Space-Efficient Simulation of Quantum Computers," 47th ACMSE, Mar. 2009, Manuscript, slides. Michael P. Frank, “Reversible Computing and Truly Adiabatic Circuits: The Next Great Challenge for Digital Engineering,” invited talk presented at the Fifth IEEE Dallas Circuits and Systems Workshop on Design, Applications, Integration and Software (DCAS-06), held Oct. 29-30, 2006, at the University of Texas at Dallas. MS PowerPoint file of presentation slides: http://www.eng.fsu.edu/~mpf/IEEE-Dallas-talk.ppt. Michael P. Frank and Marco Ottavi, “Energy Transfer and Recovery Efficiency of Adiabatic Charging with Various Driving Waveforms,” research memo (in progress), Sep. 26, 2006. PDF file of incomplete working draft manuscript at http://www.eng.fsu.edu/~mpf/memo-v0.13.pdf. Accompanying informal research presentation, “Design and Analysis of Resonant Power-Clock Drivers for Adiabatic Logic” at http://www.eng.fsu.edu/~mpf/Resonant-Logic-Drivers.ppt. Michael P. Frank, “Addressing the Funding Gap in Energy-Efficient Computing: Research Overview and Program Management Philosophy,” talk presented to the National Science Foundation, Directorate for Computer & Information Science and Engineering, Computer & Communication Foundations (CCF) Division, July 10, 2006. MS PowerPoint file of presentation slides: http://www.eng.fsu.edu/~mpf/NSF-job-talk.ppt. Michael P. Frank, “Improving FLOPS/Watt by Computing Reversibly, Adiabatically, & Ballistically,” invited talk presented at the meeting on Energy and Computation: Flops/Watt and Watts/Flop, Center for Bits and Atoms, MIT, http://cba.mit.edu/events/06.05.energy/, May 10, 2006. MS PowerPoint file of presentation slides: http://www.eng.fsu.edu/~mpf/Frank-06-MIT-CBA.ppt. Michael P. Frank, "The Reversible Computing Question: A Crucial Challenge for Computing," invited talk presented at the Workshop on Frontiers of Extreme Computing (www.zettaflops.org, Sponsors: Sandia/CSRI/Lawrence Berkeley/NSF/IBM), Santa Cruz Oct. 24-27, 2005. Powerpoint file of presentation slides: http://www.eng.fsu.edu/~mpf/FoXC-Frank.ppt. Michael P. Frank, "Requirements for Energy-Efficient Computing Beyond the von Neumann Limit," FAMU-FSU College of Engineering ECE Department Graduate Seminar, Oct. 20, 2005. Powerpoint file of presentation slides: http://www.eng.fsu.edu/~mpf/Grad-sem-fa05.ppt. Michael P. Frank, "On the Interpretation of Energy as the Rate of Quantum Computation," Quantum Information Processing (Springer), 4(4):283-334, Oct. 2005. The official published version of the article can be accessed through the online journal at http://www.kluweronline.com/issn/1570-0755/contents. A preprint is also available at arXiv:quant-ph/0409056, i.e., http://www.arxiv.org/abs/quant-ph/0409056, June 14, 2005. See below for the original Sep. 2004 conference talk. Michael P. Frank, “The Indefinite Logarithm, Logarithmic Units, and the Nature of Entropy,” research memo, June 2005. Manuscript arXiv:physics/0506128, http://www.arxiv.org/abs/physics/0506128, June 14, 2005. Slightly newer working draft: http://www.eng.fsu.edu/~mpf/IndefLog_paper/indef-log.pdf, June 15, 2005. Michael P. Frank, “Approaching the Physical Limits of Computing,” invited keynote speech and paper published in ISMVL 2005, The Thirty-Fifth International Symposium on Multiple-Valued Logic, 19-21 May 2005, University of Calgary, Calgary, Canada, sponsored by IEEE Computer Society, pp. 168-185. PDF file of paper manuscript, http://www.eng.fsu.edu/~mpf/ISMVL-Frank.pdf. PowerPoint file of talk slides, http://www.eng.fsu.edu/~mpf/ISMVL-Frank.ppt. Michael P. Frank, “Introduction to Reversible Computing: Motivation, Progress, and Challenges,” invited introductory paper and talk presented at the First International Workshop on Reversible Computing (RC’05), a special session at the Computing Frontiers 2005 (CF’05) conference, sponsored by ACM SIGMicro, Ischia, Italy, May 4-6, 2005. PDF file of paper manuscript, http://www.eng.fsu.edu/~mpf/ip1-Frank.pdf. PowerPoint file of talk slides, http://www.eng.fsu.edu/~mpf/CF05/talks/Frank.ppt. Michael P. Frank, “Requirements for Practical Reversible Computing,” invited lecture, Solid State Seminar, Notre Dame, April 19, 2005. (Host: Craig Lent) PowerPoint file of talk slides, http://www.eng.fsu.edu/~mpf/ND-Frank-ReqPracRevComp.ppt. Michael P. Frank, “Low Power Electronics: Exploring the Fundamental Limits of Computation,” invited videoconference lecture, Pragyaa Festival, Shri Guru Gobind Singhji Institute of Engineering and Technology, Vishnupuri, Nanded, India, April 3, 2005. PowerPoint file of talk slides, http://www.eng.fsu.edu/~mpf/Pragyaa-Frank.ppt. Michael P. Frank, “Reversible Computing: Its Promise and Challenges,” MARCO-FCRP/NCN Workshop on Nano-Scale Reversible Computing, hosted by the MSD (Materials, Structures, and Devices) Focus Center, Massachusetts Institute of Technology, Feb. 14, 2005. PowerPoint file of slides prepared, http://www.eng.fsu.edu/~mpf/MARCO-Frank.ppt. Position paper sent to SRC after the meeting, “Why I Believe that Reversible Computing Should be a High Priority on Our Research Agenda (Despite its Difficulties),” Feb. 22, 2005, http://www.eng.fsu.edu/~mpf/Frank-PositionPaper.doc. Maojiao He, Michael P. Frank, and Huikai Xie, “CMOS-MEMS Resonator as a Signal Generator for Fully-Adiabatic Logic Circuits,” invited paper presented in the MEMS I session of the Smart Structures, Devices, and Systems II conference at the SPIE International Symposium on Smart Materials, Nano-, and Micro-Smart Systems, held 12-15 Dec. 2004, University of New South Wales, Sydney, Australia. Published in Proceedings of SPIE, vol. #5649, paper #18. PDF file of paper manuscript, http://www.eng.fsu.edu/~mpf/Maojiao-SPIE-5649-18.pdf. Michael P. Frank, “Nanocomputing Technology Requirements,” tutorial presented Nov. 23, 2004 at the IASTED International Conference on Advances in Computer Science and Technology (ACST 2004), St. Thomas, US Virgin Islands. PDF file of talk slides, 2 per page: http://www.eng.fsu.edu/~mpf/IASTED-Nanocomp-Tutorial.pdf. Michael P. Frank, “Physics as Computing,” talk presented Wed. Sep. 15, 2004 at the Quantum Computation for Physical Modeling (QCPM) Workshop, Martha’s Vineyard, MA, Sponsored by AFOSR. Talk abstract: http://www.eng.fsu.edu/~mpf/QCPM-04/QCPM04-abstract.pdf. Talk slides, 2 per page: http://www.eng.fsu.edu/~mpf/QCPM-04/QCPM04-slides.pdf. Michael P. Frank, “The Future of Computing,” Graduate Seminar Talk, FAMU-FSU ECE Dept., Sep. 2, 2004. Talk slides, 6 per page: http://www.eng.fsu.edu/~mpf/ECE-seminar/ECEsem-6up.pdf. Two lectures presented at the Computing Beyond Silicon Summer School at the California Institute of Technology, Pasadena, CA, July ’04: “Physical Limits of Computing: A Brief Introduction,” http://www.eng.fsu.edu/~mpf/Caltech-CBSSS/PhysComp.ppt. “Reversible Computing: A Brief Introduction,” http://www.eng.fsu.edu/~mpf/Caltech-CBSSS/RevComp.ppt. Venkiteswaran Anantharam, Maojiao He, Krishna Natarajan, Huikai Xie, and Michael P. Frank, “Driving Fully-Adiabatic Logic Circuits Using Custom High-Q MEMS Resonators,” paper presented at the 2004 workshop on Methodologies for Low Power Design (MLPD ’04), part of the Embedded Systems and Applications (ESA ’04) conference, Las Vegas, Nevada, June 21-24, 2004. Published in Proceedings of the International Conference on Embedded Systems & Applications, ESA ’04, H.R. Arabnia, M. Guo, & L. T. Yang, eds., CSREA Press, pp. 5-11. Michael P. Frank, "Adiabatic, Reversible Computing for Ultra-Power-Efficient DSP," invited presentation at Texas Instruments, Dallas, TX, June 4, 2004. Michael P. Frank, “A Technology-Independent Model of Nanoscale Logic Devices,” Technical Proceedings of the 2004 Nanotechnology Conference and Trade Show, sponsored by NSTI, held in Boston, Mar. 7-11, 2004. Volume 2, chapter 2, pages 29-32. “Nanocomputer Systems Engineering,” invited talk delivered at the Department of Electrical & Computer Engineering, FAMU/FSU College of Engineering, Feb. 25, 2004. Michael P. Frank, “Reversible Computing,” Developer 2.0 programmers’ magazine (affiliated w. Dr. Dobb’s Journal), India, Jan. 2004. Michael P. Frank, "Nanocomputers-Theoretical Models," invited article (review chapter) in the Encyclopedia of Nanoscience and Nanotechnology, Hari Singh Nalwa, ed., American Scientific Publishers, 2004. Manuscript at http://www.cise.ufl.edu/research/revcomp/Nanocomputers.doc. Pradeep Padala and Michael P. Frank, “Design of a Self-evolving Scalable Matching Network for OCEAN,” poster paper accepted at the International Symposium on High-Performance Computing (HiPC’03), Dec. 2003. Pradeep Padala, Cyrus Harrison, Nicholas Pelfort, Erwin Jansen, Michael P. Frank and Chaitanya Chokkareddy, “OCEAN: The Open Computation Exchange and Arbitration Network, A Market Approach to Meta computing,” in the proceedings of the International Symposium on Parallel and Distributed Computing (ISPDC’03), Oct. 2003. “The Imminent Practicality of Reversible Computing,” invited talk delivered at the IBM T.J. Watson Research Center, Yorktown Heights, NY, Aug. 28, 2003. Powerpoint file at http://www.cise.ufl.edu/research/revcomp/talks/IBM-Talk.ppt. Shashank Shetty, Pradeep Padala and Michael P. Frank. “A Survey of Market-Based Approaches to Distributed Computing,” University of Florida, Technical Report TR03-013, Aug, 2003. Michael P. Frank, "Common Mistakes in Adiabatic Logic Design and How to Avoid Them," paper presented at Methodologies in Low-Power Design Workshop, part of the International Conference on Embedded Systems and Applications, at the International Multiconference in Computer Science & Computer Engineering, held in Las Vegas, Nevada, June 23-26, 2003. Michael P. Frank, “Nanocomputer Systems Engineering,” paper presented at the NanoEngineering World Forum, sponsored by the International Engineering Consortium, held in Marlborough, MA, June 23-25, 2003. Michael P. Frank, "Reversible Computing: Quantum Computing's Practical Cousin," invited general introductory lecture presented at the James H. Simons Foundation Conference on Quantum and Reversible Computing, Stony Brook, NY, May 28-31, 2003. Michael P. Frank, "Nanocomputer Systems Engineering," proceedings of the 2003 Nanotechnology Conference and Trade Show, held Feb. 23-27, 2003, San Francisco, CA. Michael P. Frank and Huikai Xie, “Custom micro-electromechanical oscillator for generating custom-shaped resonant energy-recovering AC voltage waveforms for driving adiabatic circuits and other applications,” disclosure to University of Florida Office of Technology Licensing, 2003. "Physical Computing Theory, Ultimate Models, and the Tight Church's Thesis: A More Accurate Complexity Theory for Future Nanocomputing," invited talk given to the Algorithms & Theory Club, CISE dept., UF, Tue., Sep. 17, 2002. Michael P. Frank, “Physical Limits of Computing,” Computing in Science and Engineering, 4(3):16-25, IEEE/AIP, May/June 2002. Michael Frank and DoRon Motter, "Quantum Computer Architectures for Physical Simulations," invited talk presented by Frank at the Quantum Computation for Physical Modeling workshop sponsored by the Air Force research labs, held at Martha's Vineyard, Wed., May 8, 2002. "Systems Engineering for Reversible Quantum Nanocomputers," invited talk given at University of Southern California, Dept. of Electrical Engineering (Architecture), Wed., May 1, 2002. "Cost/Performance/Power Efficiency of Adiabatic Circuits, as a function of Device On/Off Power Ratios," talk given in the Brown Bag Seminar series, ECE Dept., UF, March 2002. Lecture on adiabatic circuits, untitled guest lecture delivered in Dr. Bill Eisenstadt's VLSI class, ECE dept., Spr. 2002. "Cost/Performance/Power tradeoffs in Adiabatic Logic," talk given in the Brown Bag Seminar, ECE Dept., UF, March 2002. "Can Hintikka's Independence-Friendly Logic Be Used to Prove the Non-Existence of the Reals?," talk given at the Logic Seminar, Math Dept., UF, March 2002. Sama Govindaramanujam, Cyrus Harrison, Erwin Jansen, Sriram Kumar Nallan, Sahib Singh, and Michael P. Frank, “Locating Suitable Resources in OCEAN,” paper accepted for poster presentation at HiPC (High-Performance Computing), 2002. Michael P. Frank, “Efficient, two-level, fully-adiabatic, pipelineable logic family,” disclosure to University of Florida Office of Technology Licensing, 2002. "Robust and Universal Reversible Machines & High-Level Programming Languages in a Recombinase DNA System," talk given at the DARPA/NSF BioComp PI meeting, Nov. 2001. "A Mathematical Theory of Existence," invited philosophy talk given to UF's Atheist/Agnostic Student Association, Nov. 2001. "OCEAN: The Open Computation Exchange & Auctioning Network," talk given to the Harris Lab research group, summer 2001. Michael P. Frank and M. Josephine Ammer, “Relativized Separation of Reversible and Irreversible Space-Time Complexity Classes,” preprint of draft article submitted to Information and Computation, May 24, 2001. PDF at http://www.eng.fsu.edu/~mpf/revsep.pdf (reposted Jan. 26, 2014) . "DNA Computing, Reversibility, and Physical Models of Computing", invited talk given at the University of Delaware's ECE/CIS department, April 2001. "Parallel and Distributed Technology and Infrastructure," personal research overview presented to the UF CISE department's Industrial Advisory Board, March 2001. "Quantum Computational Networks," lecture series delivered as part of the Quantum Computing seminar, Mathematics Department, University of Florida, March 2001. "Reversible Logic and Its Looming Importance", Logic Seminar lecture, Mathematics Department, University of Florida, February 2001. "OCEAN: The Open Computation Exchange & Arbitration Network: An Open Platform and Commodities Market for Distributed Computation", business proposal presented to the Cenetec technology incubator firm, November 2000. "Adiabatic circuits and reversible logic: Prospects for Improving Computational Efficiency in Present and Future Computing Technologies," AeMES seminar, AeMES Department, University of Florida, September 2000. "Adiabatic logic circuits for ultra-low-power computing," presentation to Intersil corporation, June 2000. "Ultra-Low-Power Computing via Adiabatic CMOS: Current Status and Future Prospects," Brown Bag Seminars in Electronics, Electrical and Computer Engineering Department, University of Florida, May 2000. "Nanotechnology Research at the UF Computer & Information Science & Engineering Department (CISE)," presentation to Sandia National Labs, April 2000. "Adiabatic logic circuits for energy-limited applications," presentation to Siemens Corporation, March 2000. Michael P. Frank, "Reversibility for Efficient Computing," (unabridged revised manuscript of) Ph.D. thesis, EECS Dept., Massachusetts Institute of Technology, June 1999 (revision of Dec. 1999). PDF file of manuscript, with bookmarks: http://www.eng.fsu.edu/~mpf/Frank-99-PhD-bookmarked.pdf. "Thermodynamically reversible computing technology for low-power/high-performance applications," presentation to Harris Corporation, December 1999. "Thermodynamically reversible computing technology for low-power/high-performance applications," presentation to the UF Industrial Advisory Board, October 1999. "Reversibility for Efficient Computing," job talk, University of Florida, June 1999. "Reversibility for Efficient Computing," thesis defense, MIT EECS Dept., May 1999. Michael P. Frank and Tom Knight, “Ultimate theoretical models of nanocomputers,” Nanotechnology 9(3):162-176, Sep. 1998. Also presented at the Fifth Foresight Conference on Molecular Nanotechnology, Palo Alto, CA, Nov. 1997. Michael P. Frank, Tom Knight, Norm Margolus, "Reversibility in optimal scalable computer architectures," in Calude, Casti, Dineen, eds., Unconventional Models of Computation (proceedings of the First International Conference on Unconventional Models of Computation, Jan. 1998), pages 165-182, Springer, 1998. Michael P. Frank, Carlin Vieri, M. Josephine Ammer, Nicole Love, Norman H. Margolus, Thomas F. Knight, Jr., "A scalable reversible computer in silicon," in ibid., pages 183-200. "Reversibility for Efficient Computing," job talk, Texas Instruments DSP Research Division, December 1997. "The O.C.E.A.N. Project: An Open Computation Exchange & Arbitration Network," MIT AI Lab student seminar, February 1997. "Low-Energy Computing for Implantable Medical Devices," MIT Clinical Decision-Making Group research seminar, February 1996. "Quantum Computation Primitives," area exam talk, MIT EECS Dept., February 1996. Michael P. Frank, "Advances in decision-theoretic AI: Limited rationality and abstract search," Master's thesis, Massachusetts Institute of Technology, Cambridge, Massachusetts, May 1994. Janik Borota, Michael Frank, John Fry, Atsushi Ito, Hideyuki Nakashima, Stanley Peters, Michael Reilly, and Hinrich Schutze, “The PROSIT Language, version v1.0,” manuscript, Center for the Study of Language and Information, Stanford, CA, 1994. Sharon Oviatt, Philip Cohen, Martin Fong, and Michael Frank, "A rapid semi-automatic simulation technique for investigating interactive speech and handwriting," Proceedings of the International Conference on Spoken Language Processing, Bariff, Canada, October 1992. "Virtual Reality for Computer-Supported Cooperative Work (and Medical Applications)," MIT Clinical Decision-Making Group research seminar, April 1992. "Rational Distributed Reasoning," MIT Clinical Decision-Making Group journal club talk, March 1992. Matthew L. Ginsberg, Michael Frank, Michael P. Halpin, and Mark C. Torrance, "Search lessons learned from crossword puzzles," Proceedings Eighth National Conference on Artificial Intelligence, 1990. Teacher of the Year award, presented by UF ACM student chapter, 1999-2000. National Science Foundation Graduate Fellow, 1992-1995. Member of Stanford's world championship-winning team, ACM International Collegiate Programming Contest, 1991. Electrical & Computer Engineering faculty, FAMU-FSU College of Enginnering, 2004-2007 & 2010-2015. Research Associate, FAMU Physics dept., 2008-2012. Computer & Information Science & Engineering faculty, University of Florida, 1999-2004. Ph.D. in Electrical Engineering & Computer Science, MIT, 1999. M.S. in Electrical Engineering & Computer Science, MIT, 1994. B.S. in Symbolic Systems, Stanford, 1991. Debenedictis, Erik, Michael P Frank, "The National Quantum Initiative Will Also Benefit Classical Computers ," Journal Article, Computer, Vol. 51, No. 12, pp. 69–73, Accepted/Published December 2018. Frank, Michael P, Rupert M. Lewis, Nancy A. Missert, Matthaeus Wolak, Michael David Henry, "Asynchronous Ballistic Reversible Fluxon Logic," Poster, Applied Superconductivity Conference, October 2018. Frank, Michael P, "Back to the Future: The Case for Reversible Computing," White Paper, March 2018. Frank, Michael P, "Engineering Challenges for Reversible Computing Hardware," Presentation, COST Action IC1405, 7th Meeting, September 2018. Frank, Michael P, "Generalized Reversible Computing," White Paper, June 2018. Frank, Michael P, "Improved superconducting logic families (asynchronous, ballistic, reversible, etc.) --a difficult engineering challenge for SCE," Presentation, Applied Superconductivity Conference, November 2018. Frank, Michael P, "Physical Foundations of Landauer's Principle," Conference Paper, 10th Conference on Reversible Computation, September 2018. Frank, Michael P, "Physical Foundations of Landauer's Principle," Presentation, 10th Conference on Reversible Computation, September 2018. Frank, Michael P, "Reversible Computing as a Path towards Unbounded Energy Efficiency: Challenges and Opportunities," Presentation, 3rd IEEE International Conference on Rebooting Computing, November 2018. Srikanth, Sriseshan, Paul G. Rabbat, Eric R. Hein, Bobin Deng, Thomas M. Conte, Erik Debenedictis, Jeanine Cook, Michael P Frank, "Memory System Design for Ultra Low Power, Computationally Error Resilient Processor Microarchitectures," Conference Paper, 24th IEEE International Symposium on High-Performance Computer Architecture, February 2018. Debenedictis, Erik P., Jesse K. Mee, Michael P Frank, "The Opportunities and Controversies of Reversible Computing," Journal Article, Computer, Vol. 50, No. 6, pp. 76–80, Accepted/Published June 2017. Deng, Bobin, Sriseshan Srikanth, Eric R. Hein, Thomas M. Conte, Erik Debenedictis, Jeanine Cook, Michael P Frank, "Extending Moore's Law via Computationally Error Tolerant Computing," Journal Article, ACM Transactions on Architecture and Code Optimization, Accepted/Published December 2017. Frank, Michael P, "Adiabatic Circuits: A Tutorial Introduction," Presentation, Summer School on Reversible and Quantum Computing, 9th Conference on Reversible Computation, July 2017. Frank, Michael P, "Asynchronous Ballistic Quantum Computing," Presentation, Quantum Coffee Hour, September 2017. Frank, Michael P, "Asynchronous Ballistic Reversible Computing," Presentation, 2nd IEEE International Conference on Rebooting Computing (ICRC 2017), November 2017. Frank, Michael P, "Asynchronous Ballistic Reversible Computing," Conference Paper, 2nd IEEE International Conference on Rebooting Computing (ICRC 2017), November 2017. Frank, Michael P, "Feasible demonstration of ultra-low-power adiabatic CMOS for cubesat applications using LC ladder resonators," Presentation, Tenth Workshop on Fault-Tolerant Spaceborne Computing Employing New Technologies, May 2017. Frank, Michael P, "Foundations of Generalized Reversible Computing," Conference Paper, 9th Conference on Reversible Computation, July 2017. Frank, Michael P, "Foundations of Generalized Reversible Computing," Presentation, 9th Conference on Reversible Computation, July 2017. Frank, Michael P, "Fundamental Energy Limits and Reversible Computing Revisited," Presentation, Center for Nonlinear Studies Seminar, April 2017. Frank, Michael P, "Generalizations of the Reversible Computing Paradigm," Presentation, SFI Workshop on Thermodynamics and Computation: Towards a New Synthesis, August 2017. Frank, Michael P, "Generalized Reversible Computing and the Unconventional Computing Landscape," Presentation, Stanford EE Computer Systems Colloquium, October 2017. Frank, Michael P, "Generalized Reversible Computing, Truly Adiabatic Circuits, and Asynchronous Ballistic Logic," Presentation, Energy Consequences of Information Workshop, February 2017. Frank, Michael P, "Reversible Computing: The Answer to Scaling," Poster, CIS External Review Board meeting, August 2017. Frank, Michael P, "Throwing Computing Into Reverse: The Future of Computing Depends on Making It Reversible," Journal Article, IEEE Spectrum, Vol. 54, No. 9, pp. 32–37, Accepted/Published September 2017. Frank, Michael P, "Why Reversible Computing is the Only Long-Term Path for Sustained, Affordable Performance Growth," Presentation, Computational Science Seminar, Sandia, January 2017. Lewis, Ted, Art Scott, Michael P Frank, "Art Scott and Michael Frank on energy-efficient computing," Journal Article, Ubiquity, Accepted/Published September 2017. Lyke, James, Jesse Mee, Arthur Edwards, Andrew Pineda, Erik Debenedictis, Michael P Frank, "On the energy consequences of information for spacecraft systems," Conference Paper, 2017 IEEE International Conference on Wireless for Space and Extreme Environments (WISEE 2017), October 2017. Voskuilen, Gwendolyn Renae, Arun F. Rodrigues, Michael P Frank, Simon David Hammond, "The Impact of Increasing Memory System Diversity on Applications," Presentation, Salishan Conference on High Speed Computing, April 2017. Agarwal, Sapan, Jeanine Cook, Erik Debenedictis, Michael P Frank, Gert Cauwenberghs, Sriseshan Srikanth, Bobin Deng, Eric R. Hein, Paul G. Rabbat, Thomas M. Conte, "Energy Efficiency Limits of Logic and Memory," Conference Paper, IEEE International Conference on Rebooting Computing, October 2016. Debenedictis, Erik, Michael P Frank, Natesh Ganesh, Neal G. Anderson, "A Path Toward Ultra-Low-Energy Computing," Conference Paper, IEEE International Conference on Rebooting Computing, October 2016. Frank, Michael P, Erik Debenedictis, "A Novel Operational Paradigm for Thermodynamically Reversible Logic: Adiabatic Transformation of Chaotic Nonlinear Dynamical Circuits," Conference Paper, IEEE International Conference on Rebooting Computing, October 2016. Frank, Michael P, Erik Debenedictis, "Chaotic Logic: Presenting the Paper, "A Novel Operational Paradigm for Thermodynamically Reversible Logic: Adiabatic Transformation of Chaotic Nonlinear Dynamical Circuits"," Presentation, IEEE International Conference on Rebooting Computing, October 2016. Frank, Michael P, "Physical Limits of Computing," Presentation, CCR Summer Seminar, July 2016. Voskuilen, Gwendolyn Renae, Michael P Frank, Simon David Hammond, Arun F. Rodrigues, "Evaluating the Opportunities for Multi-Level Memory – An ASC 2016 L2 Milestone," SAND Report, September 2016. Debenedictis, Erik P., Neal G. Anderson, Michael P Frank, Natesh Ganesh, R. Stanley Williams, "Improving Computational Energy Efficiency: A New Approach Using Nonlinear Dynamics and Chaos," Poster, IEEE Rebooting Computing Summit 4, December 2015. Ottavi, Marco, Sarah E Murphy, Erik P DeBenedictis, Michael P Frank, Peter M Kogge, "Design and characterization of a clock distribution circuit for QCA," Journal Article, IEEE Transactions on Nanotechnology, Submitted January 2007. Frost-Murphy, Sarah E, Marco Ottavi, Michael P Frank, Erik P DeBenedicitis, "On the Design of Reversible QDCA Systems," SAND Report, September 2006.